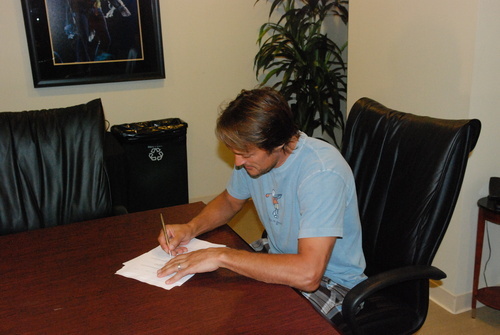 Selanne ends suspense, signs 1-year deal. Teemu Selanne said he wanted to decide whether or not to extend his playing career by September 16. Looks like he beat his own deadline by a full day. The 41-year-old right wing signed a one-year, $4 million contract Thursday that will keep the Ducks’ leading scorer in uniform for another year. The annual summer ritual of will-he-retire-or-re-sign was getting old, and there was a sense of finality this time when Selanne spoke to reporters on a national conference call. Why only one year for Carlyle, McNab, and more. Bob Murray’s contract as general manager of the Ducks runs through the 2011-12 season, and he wanted Randy Carlyle and David McNab to be able to say the same. Nothing more, nothing less. Kurri on hand Monday to honor Selanne. It’s a long way from Finland to Anaheim. But 600 goals is worth the distance. Jari Kurri is scheduled to be present Monday when former teammate and fellow Finn Teemu Selanne is honored for scoring his 600th goal Sunday – one short of Kurri’s 601. Kurri, who played for the Ducks with Selanne during the 1996-97 season, was Selanne’s childhood idol and is a longtime friend. He will be flying in from Finland specifically for the ceremony. Prior to Anaheim’s contest against Dallas at Honda Center (7:05 p.m.), Selanne will be presented with gifts from the team at center ice for his historic achievement. He will also be greeted by Ducks owners Henry and Susan Samueli. Judge throws out Henry Samueli’s guilty plea. LOS ANGELES, Dec 9 (Reuters) – A federal judge on Wednesday threw out a guilty plea by Broadcom Corp co-founder Henry Samueli, saying he did not believe Samueli knowingly made false statements to government securities regulators during a stock options backdating investigation against his company. Samueli had admitted to a single count of making false statements in May of 2008, shortly after stepping down as the chip maker’s chairman. The move came after Samueli — also the owner of the Anaheim Ducks hockey team — testified on Tuesday in a criminal trial against Broadcom’s former Chief Financial Officer William Ruehle in Santa Ana. Ruehle is accused of bilking the chip company’s investors out of billions of dollars by hiding compensation expenses and backdating stock options awarded to Broadcom executives — who profited illegally from the grants, prosecutors say. But Samueli on Tuesday rejected accusations that his company broke laws in backdating stock options and in his testimony blamed procrastination by Henry Nicholas, who was Samueli’s co-founding partner at Broadcom. U.S. District Judge Cormac Carney threw out Samueli’s plea on Wednesday after his testimony concluded. The U.S. Attorney’s Office had no immediate comment on the ruling. Ruehle’s trial started in October and is the last of the criminal backdating cases to be tried since the government began examining options backdating in 2007. The backdating of stock options grants — used to lure and retain top talent especially at cash-poor tech companies — became a major issue a few years ago, with more than 170 companies investigated by U.S. authorities or conducting internal inquiries. “We are relieved and thankful for Judge Carney’s decision. Though the past two years have been difficult, we remained steadfast in our confidence in the justice system. We want to thank all those who have stood behind us through the entire process, specifically our fans, partners, hockey personnel, and our great staff at H & S Ventures, the Anaheim Ducks and Honda Center. NHL reinstates Samueli. Updates with Samueli, Bettman reaction. NHL commissioner Gary Bettman has reinstated Henry Samueli as the Ducks’ acting owner. Samueli had been suspended indefinitely from any involvement with the Ducks and the NHL on June 24, 2008. Susan Samueli also returned to active status as co-owner of the Ducks. In support of her husband, and to avoid any possible improper appearance, she had abided by the terms of Henry Samueli’s suspension. Henry Samueli, the co-founder and former chairman of Broadcom Corp., had pleaded guilty to one count of making a false statement to the Securities and Exchange Commission in connection with illegally backdating employee stock options. In September, a federal appeals court in Pasadena refused to reinstate a proposed plea bargain that called for Samueli to serve five years of probation, pay a $250,000 fine and pay $12 million to the U.S. Treasury Department. He still awaits sentencing. During Samueli’s absence, Ducks CEO Michael Schulman served as Governor and managed the day-to-day operations of the team.